LONDON – The third time was the charm for Reese Hoffa in the men’s shot put Friday night in Olympic Stadium as the 2007 world champion won his first Olympic medal while competing in his third Games. 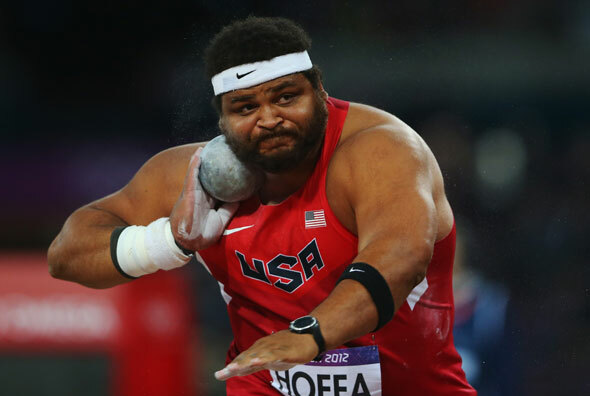 Hoffa’s medal keeps the U.S. streak alive in shot put medals begun in 1984. Other than the boycotted Games of 1980, the U.S. has failed to win a medal in the event only twice – 1936 and 1976. 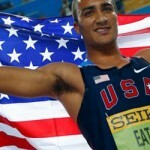 In both years, the top American placed fourth. The 2008 and 2012 Olympic Trials champion, Hoffa (Athens, Ga.) had looked to redeem a fifth-place finish at the 2011 World Outdoor Championships and did that on Friday, winning bronze with a best mark of 21.23m/69-8. 2008 silver medalist Christian Cantwell (Columbia, Mo.) was fourth with a best of 21.19m/69-6.25, and Ryan Whiting (Port Matilda, Pa.) was ninth with 20.64m/67-8.75. Hoffa and Cantwell had been tied for third after two rounds of throwing, but Hoffa’s 21.23 in the third round secured the bronze. It was an extraordinarily closely contested competition, and as expected, the European throwers showed up in a big way on the biggest stage. None more so than 2008 gold medalist Tomasz Majewski of Poland, whose winning mark of 21.89m/71-10 was a seasonal best and the second-best winning throw in Olympic history, behind East German Ulf Timmerman’s Olympic record of 22.47 (two other throwers in 1988 also surpassed 21.89). David Storl of Germany was second with 21.86m/71-8.75. 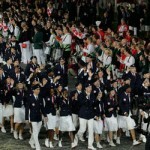 In Friday night’s women’s 10,000m final, the field was undeterred by an early surge by the Japanese contingent, and the race soon began to play out in a more conventional running – and finishing – order. Ethiopians and Kenyans soon assumed control of the race. 2008 10,000m and 5,000m gold medalist Tirunesh Dibaba successfully defended her 10km title, winning in 30:20.75 over Kenyans Sally Kipyego (30:26.37) and Vivian Cheruiyot (30:30.44). Americans Amy Hastings (Mammoth Lakes, Calif.), Janet Bawcom (Rome, Ga.) and Lisa Uhl (Portland, Ore.) placed 11th (31:10.69), 12th (31:12.68) and 13th (31:12.80), respectively. It was a personal best performance for all three American women. After four events and one day in the heptathlon, 2008 silver medalist Hyleas Fountain (Port Orange, Fla.) is in fifth with 3900 points, Sharon Day (Costa Mesa, Calif.) is 18th with 3740 points, and Chantae McMillan (Rolla, Mo.) is 25th with 3602 points. Fountain threw 11.99m/39-4 in the shot put for 660 points and ran 23.64 in the 200 for 1016 points. Day threw a personal-best of 14.28m/46-10.25 for 813 points and ran 24.36 for 946 points; McMillan threw 14.92m/48-11.5 for 856 points and ran 25.25 for 864 points.